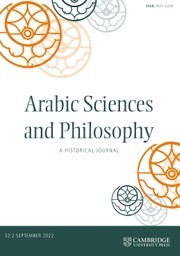 Arabic Sciences and Philosophy (ASP) is an international journal devoted to the Arabic sciences, mathematics and philosophy in the world of Islam between the eighth and eighteenth centuries, in a cross-cultural context. In 2009, the journal extended its scope to include important papers on scientific modernization from the nineteenth century in the Islamic world. Together with original studies on the history of all these fields, ASP also offers work on the inter-relations between Arabic and Greek, Indian, Chinese, Latin, Byzantine, Syriac and Hebrew sciences and philosophy. Casting new light on the growth of these disciplines, as well as on the social and ideological context in which this growth took place, ASP is essential reading for those interested in these areas.